The album is definitely Van Halen’s greatest. 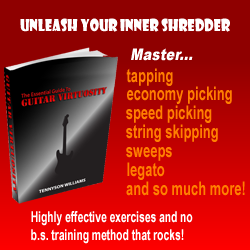 It features the awesome air guitar worthy solo ‘Eruption’, with amazing guitar work featuring techniques such as tapping, dive bombing and harmonics. The guitar tone is amazing. In addition to the outstanding contributions from Eddie Van Halen (guitarist), there’s some top tunes on this album. This is personally my favourite album, It can never really be matched. If you don’t buy it, it really is your loss. Runnin’ with the Devil instantly lets you know you’re going to enjoy this album. The cool car horn effects at the beginning fade out to Michael Anthony’s classic bass-line, then Eddie rakes the strings behind the nut to kick in the song. Magical. Eruption is without a doubt the greatest guitar solo of all time. 1 minutes and 44 seconds of pure air guitar, with Eddie’s monster tone, outrageous whammy bar dives, trills and tapping. This solo single-handedly revolutionised electric guitar, and influenced the whole hair metal scene of the 80’s. You Really Got Me is a cover version of an old classic by The Kinks. It’s recognisable, but has been totally renovated with a metal tone and great solos. Ain’t Talkin’ ‘Bout Love is a true classic, it features the greatest riff ever to come from the key of A minor. Another notable track is Atomic Punk, which starts off with a unique phaser intro, followed by another great riff and awesome solos. You really do have to hear this stuff for yourself. I could go on and on about how amazing this album is! There’s not a bad song on this album, go and check it out.